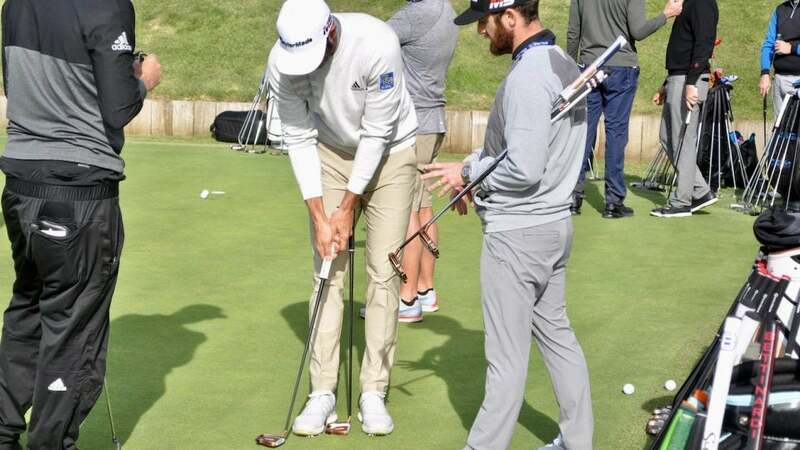 Dustin Johnson and TaylorMade Tour rep Chris Trott discuss Spider Tour putters. PACIFIC PALISADES, Calif. — For whatever reason, the Genesis Open has turned into a regular equipment testing ground for Dustin Johnson. Drivers, irons, putters, grips — Johnson has literally put something new from each category in the bag over the last several years. It's very possible Johnson could continue the streak after he was spotted testing a 2019 TaylorMade Spider Tour mallet and TP Black Copper Juno blade on the practice green at Riviera. Johnson recently won in Saudi Arabia with an all-black version of Spider Tour that's been his go-to flat stick for more than a year, but struggles with pulled putts led him to take a look at other options. Working with TaylorMade Tour rep Chris Trott, Johnson rolled the Juno with a red PureRoll insert (white line on the flange) and numerous versions of the new Spider Tour without a sight line — his preferred look at address — and different weight configurations, including a 12-gram weight in the toe and 2-gram weight in the heel to square up the face at impact. Trott also tried a trick Retief Goosen used years ago, placing more weight in the heel, with a slightly lighter swing weight, to help with toe release. When neither weight setup produced a noticeable improvement, Trott returned to the original setup, placing a 2-gram weight in the heel and toe of the Spider. The one change that did seem to work during the practice session was a cross-handed grip, but Johnson was spotted later in the day putting with a conventional grip — the Anser-style Juno in his hands. Dustin Johnson tests a TaylorMade TP Black Copper Juno prototype blade (L) and 2019 Spider Tour mallet (R). 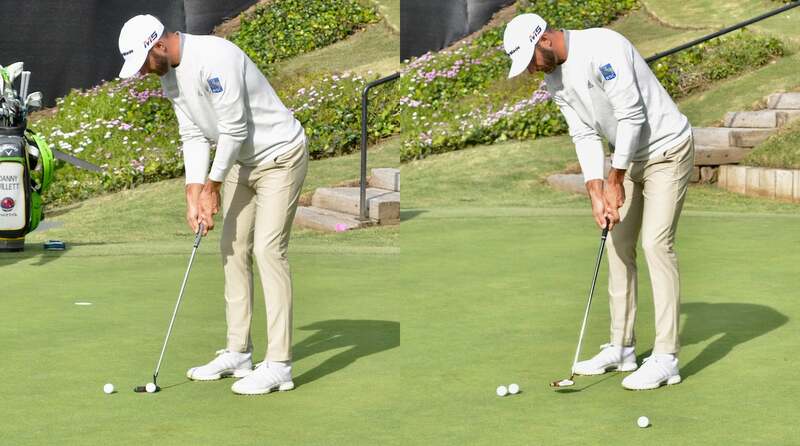 As is the case with many potential equipment changes, Johnson's putter situation remains incredibly fluid. But if Trott had to guess, there's still a possibility Spider Tour could get the nod on Thursday. "He likes the way [Spider Tour] lies and sits," Trott said. "From working with him, he wants to get into the new Spider. We just need to find something he's comfortable with." As for the grip Johnson plans to use this week, it will be SuperStroke's CounterCore Pistol GT 1.0, the same grip he started using during the 2017 Genesis Open — an event he'd go on to win. Although, as Trott pointed, Johnson's grip has one noticeable difference compared to the retail version. "The leather is wrapped tighter," Trott said, "so if you feel them side-by-side, the edges are sharper. That's how he likes the grip to feel in his hands." 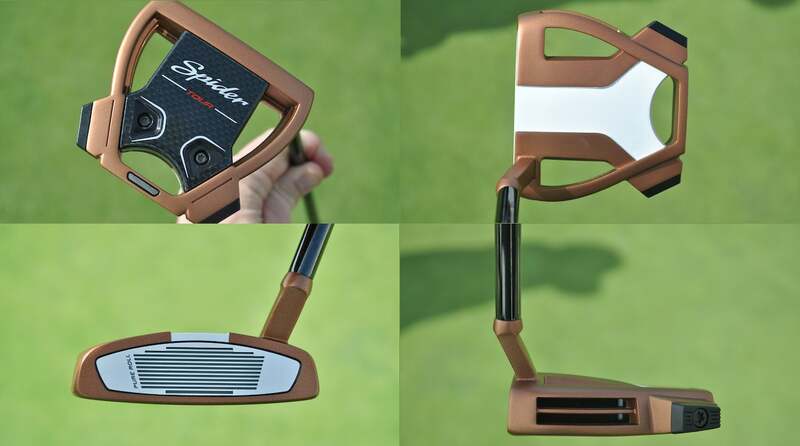 In-hand photos of Dustin Johnson's TaylorMade 2019 Spider Tour putter.